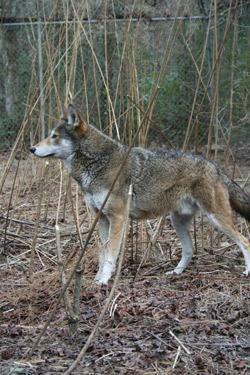 Red wolf recovery program: Will climate change destroy red wolf habitat? Red wolves are what you might call, in polite conversation, conservationally challenged. They were among the first batch of species listed under the Endangered Species Act when it was minted in 1973, and they were on even earlier lists predating the ESA. They’ve been endangered ever since. Red wolves exist in only one place in the wild: on the Albemarle Peninsula of North Carolina. They were released there starting 25 years ago as part of the red wolf recovery program, which is managed by the U.S. Fish & Wildlife Service. The peninsula is surrounded on three sides by sounds. The low-lying coastal plain is slowly sinking while sea level is rising. In the next century, up to a third of the red wolf’s recovery area might be reclaimed by the ocean. Endangered red wolves will have nowhere left to run. Has the recovery program come this far only to be thwarted by climate change? If you’re not sure what a red wolf is, don’t worry, you’re not alone. Many people are unaware there are two species of wolves in the United States: the gray wolf and the red wolf. (On this point, don’t rely on Wikipedia—while the site lists red wolves as a subspecies of gray wolf, few experts agree. It is widely referred to as its own species, Canis rufus.) Red wolves are lanky and lean, smaller than a gray wolf but larger than a coyote. To my eye, their carriage is suggestive of a well-muscled greyhound. They aren’t red like a red fox is red; rather, their coloring ranges from tawny to beige with black, and a distinctive dusting of burnt umber tends to grace the backs of their ears and tumble across their shoulders. Many red wolves hold their ears at a characteristic 45-degree angle, which gives their heads the look of an inverted triangle. Today, there are fewer than 100 wild red wolves in the reintroduction area. Another 200 or so live in captivity as part of a species survival plan administered by the Association of Zoos and Aquariums. Red wolves were the first wolf species to be reintroduced in the United States—the gray wolf reintroduction project in Yellowstone National Park is better known, but it followed by eight years. In the past, red wolves ranged throughout the Southeast. They may have lived from Florida north to Pennsylvania, and west to southern Illinois and central Texas. Red wolves will probably never have a future unmanaged by human hands. Their landscape has changed fundamentally from the one in which the species evolved. The eastern forest is now laced with human settlements, something red wolves tend to avoid. Red wolves have been shot, often because they were mistaken for coyotes. The eastern coyote did not historically share the red wolf’s territory. Reintroduced red wolves that encounter eastern coyotes will sometimes mate with them, producing hybrid offspring. Hybridization with coyotes was the single greatest threat to the last wild red wolves of southeast Texas and southwest Louisiana in the early 1970s, when 14 red wolves were captured for breeding. When red wolves were first released to Alligator River National Wildlife Refuge on Sept. 14, 1987, coyotes were about 500 miles to the west. But today, coyotes and red wolves live side-by-side on the Albemarle Peninsula. The threat of hybridization may appear to be the biggest roadblock to the red wolf’s recovery, but climate change may be a bigger one. In Alligator River National Wildlife Refuge, which some experts consider to be ground zero for rising seas on the East Coast, biologist Dennis Stewart has witnessed forests of pond pines retreat a mile inland over the course of two decades. Sawgrasses and marsh then filled in where trees once stood. Pond pines are exquisitely sensitive to saltwater; their needles brown and whither when sprayed with salty water during nor’easters. They die outright when their roots sit in salty sound water pushed inland from storm surges, or from gradually rising sea levels which intrude into coastal soils and groundwater. When the pond pine forests retreat, they are first replaced by small shrubs and invasive phragmites (a type of reed). As the soil becomes even saltier, these communities then morph into salt meadows and salt marshes. David Rabon, the red wolf recovery program coordinator, is cooking up a Plan B, identifying other sites suitable for reintroducing red wolves. Additional reintroductions are currently forbidden by the red wolf’s recovery plan, but it’s a way to hedge bets for red wolf generations to come. He is focusing on areas that have low human population and road densities, as well as suitable prey, but that also have “the political or regulatory structures in place that will help us to establish the rules and techniques or policies that will aid our ability to recover a species.” One of their partners is the Wildlands Network, which is modeling wildlife corridors and habitat connectivity in the Southeast. Rabon also says his program is “lucky” that it’s dealing with a species that is a generalist. Red wolves can live in a variety of habitats and eat pretty much anything: deer, raccoons, nutria, rabbits, birds—even lowly bullfrogs and mice. Eyeing additional reintroduction sites does not mean that people have given up on the current recovery area. One of the quirks of the Albemarle Peninsula is that it is crisscrossed with landscape-scale plumbing in the form of ditches and canals designed to bleed the region’s abundant freshwater to the ocean sounds. But these same canals and ditches have been infiltrated by the sea, which now shoots dense saltwater plumes inland. The Nature Conservancy worked with others to develop a check-valve, which allows freshwater to flow outward through the canals, while halting the saltwater plumes from creeping inland. They have also installed water-level control structures and ditch plugs, which seek to hold freshwater back and slow its arrival to the sea, thereby keeping delicate peat and organic soils saturated with freshwater for longer. Another component of the climate change adaptation strategies is assessing the salt-tolerance of different plant species. Hundreds of black gum and bald cypress seedlings were planted several years ago at a test site on the eastern side of the refuge. Christine Pickens, a coastal restoration and adaptation specialist with the Nature Conservancy, has found that only the bald cypress have survived. Many, but not all, of those trees were at the back of the site, where it was slightly more elevated. “But we’re talking mere centimeters of difference,” Pickens says. The point of the test was to see if salt-tolerant species planted near the shoreline could hold onto the soil just a little bit longer, keeping the habitat intact and giving species that much more time to adapt. Research has shown that some wetlands have kept pace with sea-level changes over thousands of years. The trick is for the wetlands to accrete soils in lockstep with sea-level rise. They do this by producing leaves, shoots, and roots that decompose very slowly after they drop down into flooded soils. “The ocean is going to rise,” Pickens says, “but if we can restore some of the natural processes of these ecosystems, then it helps the plants to be able to survive better and accrete sediment so that our land can keep pace with our water.” And if that happens, more of the forested habitat of the peninsula will stay intact for longer, providing refuge for red wolves. I don’t blame my colleague for asking if we should just let red wolves go. If they did go extinct, most people wouldn’t bat an eye. The ecological damage of losing the red wolf was wrought well over a century ago, when they were largely wiped out of the Southeast. It’s not like red wolves directly affect most people’s day-to-day lives; they don’t clean the air or sequester carbon. They very likely don’t harbor a cure for cancer or diabetes or erectile dysfunction. Reintroducing them isn’t going to bring back American chestnut trees or restore the Southeast’s long-gone long-leaf pine forests. But if we did let them go, what does that say about our values? That we couldn’t be bothered to devote time and money to retaining a species that our forefathers hunted and drove off the land to the point of near extinction? That we couldn’t restore a unique mammalian carnivore to just a smidgen of its former range? That red wolves were just too much trouble? For me, saving the red wolf is about more than just red wolves. We have created a world that is so altered from the one in which the red wolf evolved that it is now challenging for them to survive. Is that perhaps our future as well? In asking if red wolves are completely screwed, what I heard my friend asking was: Are we completely screwed? If we can’t save the red wolf, what does that say about our ability to save ourselves?